Enthir is a Bosmer sorcerer living on the second floor of the Hall of Attainment, in the College of Winterhold. When meeting him for the first time, he claims to be able to obtain "hard to find" items, and instructs you to meet him in his quarters to conduct business discreetly. He occasionally travels to the Frozen Hearth inn in Winterhold. Enthir sells mainly mage equipment and supplies, such as staves, robes, scrolls, ingredients, spell books, and soul gems. He does sell some rare items, such as daedra hearts and black soul gems. He will buy any type of item. He wears expert robes of illusion and a pair of boots. He also carries an iron dagger. He knows the Alteration spell Ironflesh, the Destruction spells Frostbite, Ice Spike, and Ice Storm, and the Restoration spells Fast Healing and Steadfast Ward. This is the merchandise found in Enthir's merchant chest. These items are only available if purchased from the merchant; they cannot be pickpocketed or stolen. They are restocked every two days. Arniel: "Err, excuse me Enthir. Might I have a moment?" Arniel: "Yes, err, apologies for the intrusion. I was wondering, err, if you could possibly, ah, procure a few select items for me." Enthir: "Really, Arniel? Because I seem to recall doing just that for you recently, at which point you assured me that you'd cover my expenses. And that, my nervous little friend, has not happened. Would you care to comment on that, perhaps?" Arniel: "Ahh, hmm. Yes. I, err, I was unaware that I had forgotten that. I will, err, I mean I'll take care of that as soon as possible." Enthir: "See that you do." Enthir: "So, Arniel. How's that little project of yours coming along? Any progress worth mentioning?" Arniel: "Oh, that. Err, yes. It's... It's quite promising, I believe. Definitely on the right track. Results, err, results should be soon." Enthir: "Right. And what did you say the point of this little venture was?" Arniel: "Oh, no. Err, wouldn't do to say at all. Not, err, not now. Not at all. I have far too many things to do still." Enthir: "If you say so." Enthir: "You haven't heard any more about dragon sightings, have you?" Arniel: "No, which is fine with me." Enthir: "A pity. You have any idea how much fangs would be worth? Or even better -- bottle their flame. The right buyer would pay an immense amount." Arniel: "Bottle... their flame? I can't... No, I don't think I've any interest in that sort of thing." Enthir: "Is it true? Are there really dragons in Skyrim?" Faralda: "There's talk of it, but I find it hard to believe." Enthir: "I do hope it's true. So many opportunities..."
Enthir: "What? Oh, nothing. It's just... It's an interesting development." During the quest Hard Answers, Enthir is found in the Frozen Hearth and has different dialogue and behavior. Oddly enough the voice actor used for Mercer Frey is used during the quest, despite the two characters being at odds with each other, and no attempt at a variation between the inflection of the two characters seems to have been made. Enthir will never initiate dialogue with fellow College members, as all the scenes were set to take place in the Hall of Countenance where none of them will ever meet. You must trade with Enthir before you become an Archmage or he will not trade with you. Several bugs have been noted with the dialogue, but the default behavior indicates that if you trade with him before you become the Archmage, then you should continue to be able to trade with him. This can be fixed by adding a hidden Enthir Vendor perk with the following command in the console: player.addperk 0006bc37. Enthir may get stuck in the Frozen Hearth. You can fix this with console commands. Go to the Hall of Attainment, use prid 1c1aa and then moveto player. This will teleport him to you. 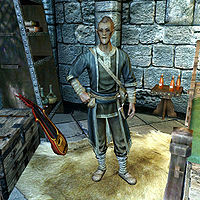 After completing the Thieves Guild quests and joining the College, Enthir may lose his status as a fence. Despite having two separate dialogue options (one for his old retail mode and another for his fence mode), he will only buy non-stolen goods, and will be limited to the original 500 gold. You can head to Winterhold and use console commands prid 1c1aa and then moveto player. This will teleport him to you. Then Enthir will have the same amount of gold as the other fences (max of 4000 gold), and will buy stolen goods. If Enthir is in the courtyard of the College of Winterhold during a dragon attack, he will act as though he is observing a brawl and not fight or flee, even while he is personally being attacked. Player: "So they were like your kind?" Enthir: "Like the Altmer? Yes, I would say their culture quite possibly rivaled our own." This page was last modified on 13 March 2019, at 22:16.